When shows get popular, the merchandise is not far behind. There are many shows that I collect merchandise from, but a lot I don't. True blood is a good example of a show that I buy stuff. 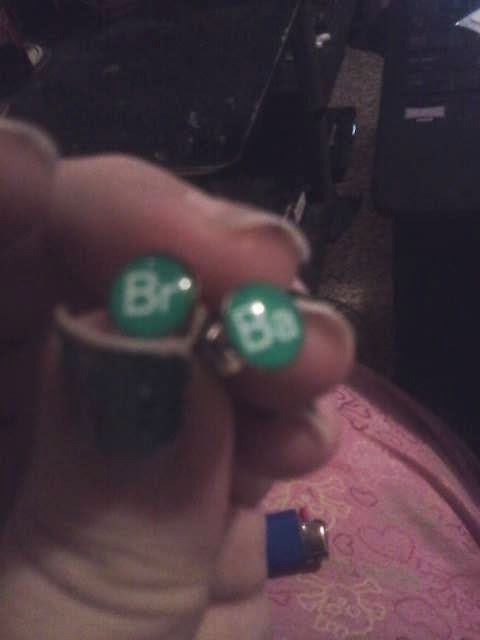 Breaking Bad is a great show, it may not be for everyone, but I still like it. It is seen as just a show that glorifies drugs, the manufacturing of drugs, and drug use. Breaking Bad, though is so much more. Yes it is about all of those things, but it is also about the state your life is in at the end of the experience. The lives were ruined by drugs, that is what I take from the show. When I found out that I was reviewing these earrings, I was crossing my fingers and hoping that they wold be very well made. There are so many things for tv shows, that aren't made well at all. They know they can get people to buy the stuff because of the fad of the tv show or movie. Never putting any real money or effort into the items. So I was pretty excited when the package came in the mail. I was unsure how they would be shipped and hoped the metal piece in the back would be intact and not bent. Once those bend, the earrings are pretty much useless. These were packaged well and they came safely to me in good condition. I opened the package up immediately and took them out to check them out. 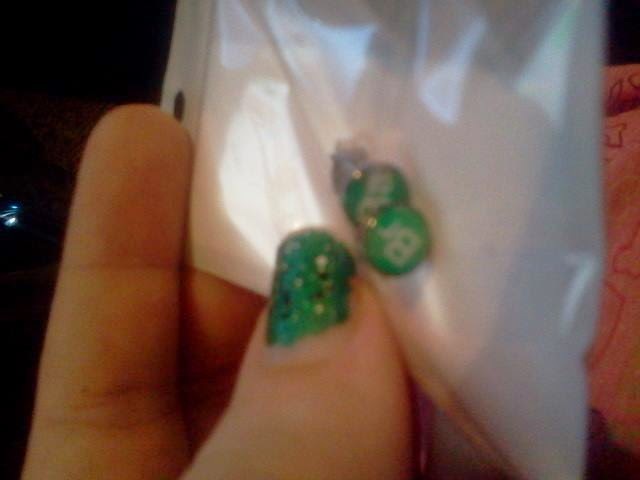 These are a cool green. 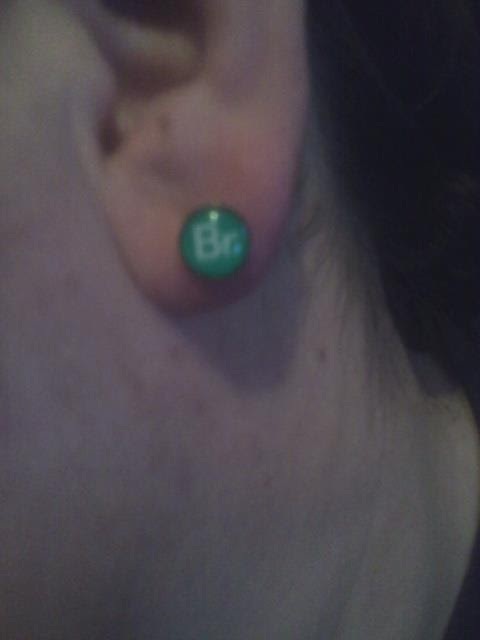 They are made very well and slipped right into my ear. I made sure to sterilize them first. I am sure they were clean, but I always take the time to keep myself safe. 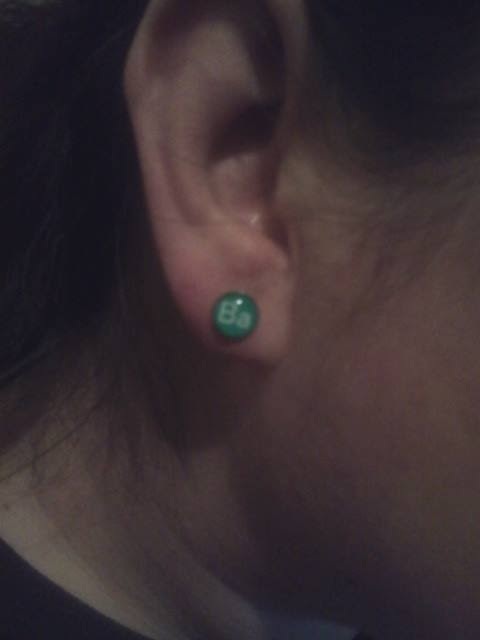 I love how they look in my ears, and I have had a few compliments on them. Most people aren't sure what they are suppose to mean or what they are for and I have to explain it to them. I really like these earrings. 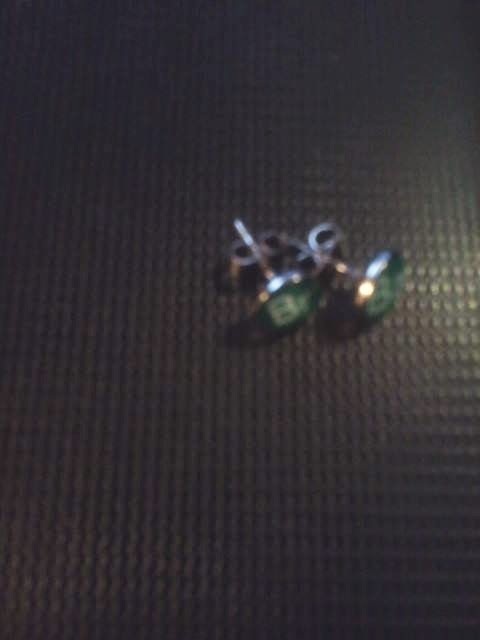 As I said earlier, they are very well made and look pretty nice in my ears. With how sturdy these seem to be, I think they will be around for a long time. Thats not always the case with earrings, so that alone is awesome. I will continue to wear these until I can't anymore. You really need to head on over to amazon and check these out, by clicking here. From there, you can find out more about this product, see what others are saying about these earrings, and buy some for yourself!